“It’s becoming cyclic; not eschatological.” Pause. I don’t know if this has always been Padi Rex R.B. Reyes’ way of talking – slow, discerning, calculating. So many pauses in between. Is he actually stringing together words while speaking? Is he picking out the right words, editing sentences in his mind? Is a pause an invitation to think? “Human degeneration and human degradation,” he continues, “it’s happening again and again and again. It’s as if we’re not equipping ourselves for The Coming.” Pause. These intimate thoughts are spawned by news that apparently caught both our eyes. He says he’d read about China lending the Philippines billions for a Chico River dam project over breakfast. Abroad for an ecumenical assembly, I’d read the headline on Facebook: “China lends P3.14B for Chico river irrigation project.” Of course it would be a dam; what else would it be? The project, worth P4.37 billion in total, would reportedly provide a stable water supply for 8,700 hectares of agricultural land in Cagayan and Kalinga. But the Sagadan says: “How are we supposed to go up home?” Here is an Igorot (he is the first National Council of Churches in the Philippines general secretary with indigenous blood) exasperated with the work ahead. Again. 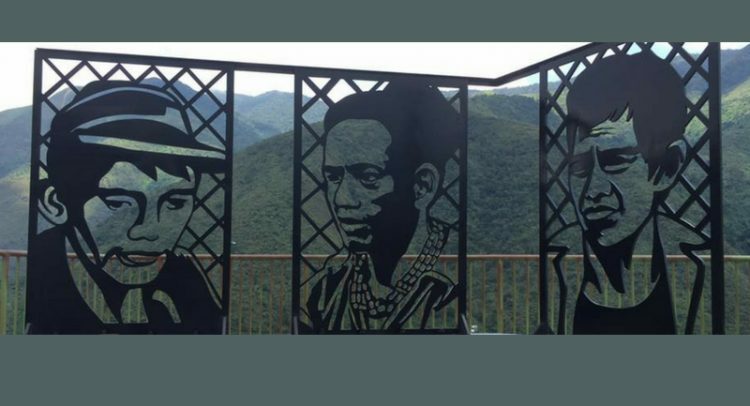 Decades ago, Igorots – particularly the people of Mountain Province, Bontok and Kalinga – mustered a three-decade resistance to a similar project. Back then, parties went to survey the lands, later on told villagers they needed to possess land titles, and finally informed them they were about to be resettled. The government had already planned things out, sans consultation with the people. Some 100,000 people were to leave their villages, forests, swiddens, burial grounds, all of which would end up underwater. The people would not have it. The villagers sent envoys to the President (in failed dialogues, they were reportedly called sentimental, stubborn and selfish). As armed men began assisting the World Bank and implementing agency National Power Corporation in commencing the project, opposition also grew stronger: Villages forged peace pacts among one another; people kept vigils even at night, barricaded the sites where construction would take place. Women were at the forefront of the resistance. They fearlessly dropped their daily tasks to get to the frontlines. At one point, they lay down on the roads where big trucks would pass. In one encounter that literally went to the books, they even removed their clothes in protest. Many of those that took part in that confrontation were detained for six months; but opposition was not extinguished. 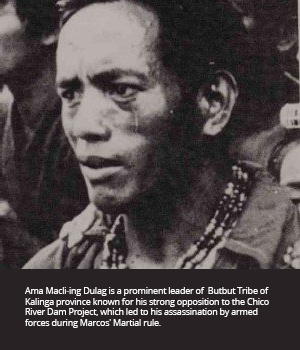 When I was younger, my father, a schoolmate of Padi at Saint Andrew’s Theological Seminary, explained to me and my sister the life of Macliing Dulag of the Butbut tribe, while we watched a movie about him on PBO. We didn’t pick up much, of course, but I’d later on study at the University of the Philippines Baguio, where the Cordillera Studies Center – and a relic from the bullet-riddled home of Macliing – could be found. Imagine the rich Cordillera culture and sentiment that surrounded me for four years. Padi has been so affected because he was part of the collective dissent then: “Do I have to fight again? Is the one thing I fought when I was young something I have to fight yet again in my twilight years?” Pause. Knowing him, this is no more than a rhetorical question. Of course, he will fight again. But, examine the kind of mentality that had many times before led to the resurrection of this issue. How come the dam was a priority project again approaching Year 2000 and many other times after then? To think that some people have seen the historic resistance as a landmark case for the protection of indigenous peoples. Moreover, imagine the kind of mentality that sustains the damning stereotypes against the Igorots (and even Mangyans, Badjaos, Lumads and other indigenous peoples, for that matter) that they are no good, second-class humans – that have tails. “A little less than humans, a little more than animals,” explains Padi. Pause. Questions then rush into my head. How far from us do we think indigenous peoples are? How bad are they at expressing themselves (if they are, at all) such that governments forego consultations with them; such that people from the mainstream forget to immerse or dialogue with them? How ignorant are we to blindly agree that development projects are “for development”? You see, nowhere has my understanding of prophetic witness been clearer than here. There is negligence, abuse, oppression, uprising, death, intimidation, but also a constant summons to prophetic witness, he says. “Not foreseeing but seeing greater; proclaiming the Word with actions that build the Kingdom here and now.” Pause. And that’s exactly how we don’t fall into the cycle, I think. There’s a widespread acknowledgment that the world is suffering; that an imbalance needs, well, balancing. But, aren’t we too resigned to the status quo, to “an impending doom” thinking? Thus, Creation groans, we hear it. Period. That is basically upholding the cycle. That should not be. In my ongoing journey out of armchair Christianity, I’ve learned that the greatest disaster has been knowing (and singing about) “amazing grace” and not doing it. In order to make change happen, grace must transform us and then transcend us. Take salvation. Personal assurance may give you comfort, but not necessarily comfort or mend the world. Some will even call this out as apathy. Given the great maladies of the world, salvation, deliverance – however you may call it – should be paid forward. Thus, faith should be a lifestyle, a living out; a personal renewal that compels one to renew the world, too. For most of my life, I’d kept repenting by praying, saving by interceding, proclaiming by parading. But, especially in the reality of environmental injustice and development aggression, among other problems, the language of faith should also be solidarity. Where the burning heat of the sun, the biting pain of hunger, the freezing horror of rain, the brazen violence of hostility are all too real, real people should engage in real works confronting real passions. Pray, yes, but act, too. For example, in our daily lives, we should repent for our harmful practices through practical measures: less single-use plastic; more greening; more recycling, reusing, reducing. There are so many motherhood statements we do not execute. “There’s no need to be martyrs,” Padi reminds the small group, too. But there’s a constant need to think critically; to antagonize oppressive systems, processes and principalities; and champion the fullness of life. Thus, a more profound calling. “Nasaan ang iyong kapatid?” he asks. Pause. Oh, yes. Indigenous peoples have low carbon footprints and extensive wisdom on sustainable living that we do not fully appreciate and should. Land is life for them, so we should help them be secure in their lands. Indigenous peoples have sensibilities that we need to respect, thus we should accompany them in their journey for self-determination. Above all, they are our siblings, thus we must give them the rights and dignity we would expect for ourselves. The environmental imbalance now spawns more and bigger disasters, so we should always be ready to help. We must reach out to indigenous peoples and other poor and vulnerable siblings even outside times of trouble, so they can better prepare. We should participate in effective campaigns that restore the balance, not only online awareness brigades, but also cleanup drives, tree-planting activities and other events that situate us in the degradation. We should lobby for meaningful laws that can help us collectively heal Creation, from indigenous peoples’ rights to land reform to environmental protection to disaster risk reduction and management. 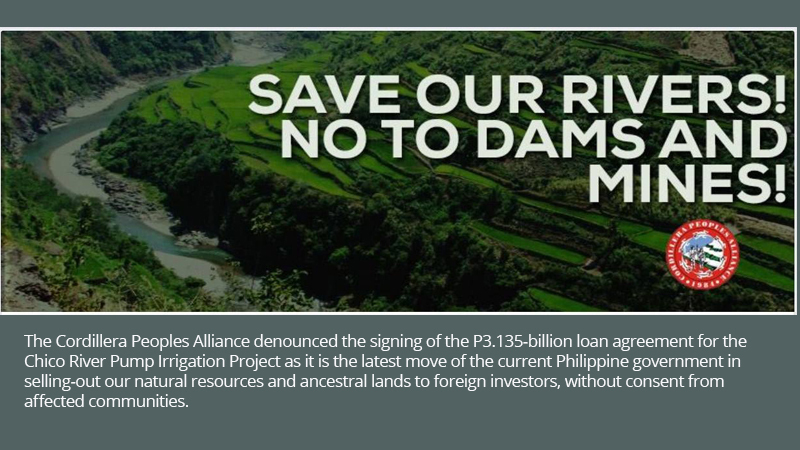 And, if my sibling from Sagada, Mountain Province, says he would suffer far-reaching consequences with the Chico River dam “development project,” I should listen to his plea and accompany him in his crusade. So many thoughts crowd my head. Thanks to the pauses in between. Vaughn Geuseppe Alviar is the chairperson of Kalipunan ng Kristiyanong Kabataan sa Pilipinas and deputy secretary of the Youth of the Iglesia Filipina Independiente. KKKP is the expression of the ecumenical movement among Christian youth in the country, of which YIFI is a member. This is the first of many reflections from young Christian voices, which we will post in the NCCP website in partnership with KKKP.